It's just a few clothes run through a couple of machines, right? How much time could that take? After all, the machines do all the work, and we just move the clothes from one spot to another. Laundry is a never ending task around our house. We generate a lot of dirty laundry, and most, (but not all) is legitimate. You know what I'm talking about, the pair of pants that your kid looked at and decided to put in the hamper instead of back in the closet? I don't call that "legitimately dirty". Our kids are in several different sports and not only do they generate a lot of dirty clothes, more often than not, there are tough stains involved. Combine that with yard work clothes, play clothes and just general daily living clothes (not to mention the towels...oh, the towels, and here we are on the verge of what I call "towel consumption season"...), you get a lot of loads of laundry. We could do laundry every day and never be caught up. Busy Dad does a lot of the laundry, and he comes from the school of, "Wash 2-3 items at a time" (I come from the school of, "If it fits in there, you can wash it")because he's concerned that things might not get properly clean, so, we're pretty much doing laundry all the time. If there were something sturdy (we are hard on washers and dryers, y'all)that could enable me to spend less time on laundry and still get things clean, I'd certainly be all over that. Samsung front-load washer with Exclusive PowerFoam technology looks like it might be a contender. It's a large washer (holds 28 bath towels, my kinda machine! )so that means you'll do fewer loads and save water and electricity, too. But, when you have such a large load, getting things thoroughly clean is a concern, and that's where the PowerFoam comes in. 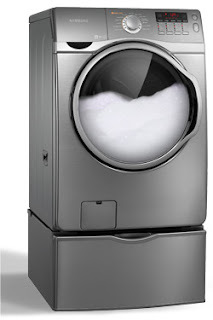 It makes a powerful (but safe) foam using your regular detergent that penetrates fabric more deeply and quickly, allowing you to wash large or bulky loads in less time. Less time on laundry? OK by me! What would I do with that extra time? I should say it would free me up to take care of the rest of the house or make homemade crafts or something. But, I think I'd probably get everyone to bed earlier, since we tend to do laundry at night and the evening schedule can get derailed. Everyone's days would probably run much more smoothly if we had more time in the evening to relax and prepare for the next day. Now, if Samsung would just come up with something that would make the kids put their clothes away instead of sending them straight back to the laundry when they don't want to deal with them, I'd be the most well-rested person ever. a) Leave a comment telling us what you'd do with more time. Don't forget to visit the Promotions and Prizes section for even more chances to win! Also, be sure to come visit me at Busy Mom Blog, it's always open! I wrote this post while participating in the Samsung/BlogHer program on behalf of Samsung. I received monetary compensation for the time to write my post. If I had more time, I'd nap. With my extra time I'd work on my photography skills. I would take a nice long long bubble bath. I would spend more play time with my kids. I'd probably just do more housework. I would catch up on my reading with the extra time. I would clean out my closets. I'd get more school work done if I had extra time. If I had more time, I would take a LONG bubble bath and read a good book on my kindle. If I had extra time, I would spend some of it reading on my deck. I will take a photography class if I have more time. I'd read more and maybe get through the stacks of unread National Geographic I've accumulated. Extra time - I'd learn how to Zumba! 28 bath towels?? I don't think I could get 28 wash cloths in my washer. If I had more time, I would exercise! ha ha ha I would sleep. Or spend more time in a Wikipedian Loop. I would spend more time with my family! If I had more time, I'd sleep, yes, for sure sleep!! If I had more time I would attempt to iron some of the clothes that are piling up. I would walk more often with the extra time. Read more! I used to read a lot but since my four and five year olds were born I hardly ever have time to read. Weed the garden. I promise! I would read, read, and then read some more!! If I had more time I would sleep…and then sleep some more. If I had more time, I would have a garden. If I had more time I'd sleep. I have teenagers and feel like I've been sleep deprived for several years now. Humm--there lots of things I should do, but I'd probably take more naps. If I had more time, I would sleep. If I had more time, I'd read more blogs! I would take longer walks with my daughter. oo i would definitely take a long overdue nap!! If I had more time, I'd take up a hobby, like crafting. I would be outside playing in the yard more if I had more time. I'd spend my extra time shopping for bargains. I'd have more time to spend trying new recipes! If I had more time, I'd spend it in the garden and yard. Wow, I might be able to make my family some really good meals. Always feel so rushed by dinner time. This would be great. If I had more time....I wouldnt know what to do with myself!!! I would like to take a flower arranging class! If I had more free time I would definitely read more. I would take some time for myself with the time I'd save with one of those, maybe play a video game. If I had more time I would learn a new language. Italian maybe and then go to Italy! With more time, I'd like to cook more & sleep! with extra time i would work out! if i had more time - i'd enjoy just relaxing and doing whatever I wanted! If I had more time I would knit and spend time with my family. I'd do more yoga and reading. I would spend that extra time with my kids at the park! If I had more time I'd travel! I'd go for more walks and write more, since the washer does it all for you. If I had more free time I would...vaccuum more!! If I had more time, I'd go to culinary school! I'd read all those books that are on my wish list. If I had more time I'd paint my toenails. I would paint more!-- which means I would probably have to wash more as I always get paint on my clothes. Wow, these would sure save a lot of time! I'd use the extra time to catch up on my reading. If I had more free time I would definitely get motivated to learn some new work related software, like Access, to try to help me get a new job! I would probably do some sewing. I'd love some free reading time. I would love to have more time to scrapbook. I would work on my blog. Just discovered yours and it is funny! Your tweets are great, too. Regarding laundry, my philosophy is like yours with one addition: if it fits, you can wash it all in hot! busymom1.blogspot.com/2011/06/samsun… @BusyMom is hosting a $100 giveaway here. With more time I would do quite a bit more baking and cake decorating. If I had more time I'd read more of the over 400 books on my to be read mountain. More time? I'd blog, of course! I would spend more time outdoors. If I had more time to do other things I would curl up with a good book or go swimming depend on the weather and my mood. I would catch up on some reading with more time. I would be in the garden more! If I had more time, I would try to open an online store on Etsy or ebay. I want to declutter! If I had more time I would read more blogs. I find so many interesting stories but since I blog full-time myself I rarely get a chance to check out other bloggers and find out what they are doing. If I had more time, I'd learn how to sew. I would really like to be able to make my little girl nice rompers and the like. If I had more free time, I would definitely clean my house from top to bottom. If I had more time from doing laundry for a family of 7!!! I think I would read more often. If I had more time, I'd finally get all of my photos organized and labeled. With more time, I might actually get ALL of the ironing done for a change! If I had more time, I would try to organized the closets in our home. I would love to have more time to read. If I had extra time I'd quilt. I love quilting, but now time! With more time... I'd spend more time with the significant other. I'd nap more. Dance around and oh my goodness.. READ a book. Reading is such a luxury. If I had more time, I would take my girlfriend on more picnics! If I had more time I would garden more! If I had a extra time I might start a Etsy store :) Thanks! With more time, I would pay more attention to my outdoor plants, and call my best friend more often. I have a beautiful needlepoint that I have not worked on in a while. I'd like to finally finish it and have it framed. With more time, I'd love to read and work out more, two things that tend to go to the wayside with a hectic home and work schedule! I would garden and read. She's bound to find something creative to fill it with. I would sign up for piano lessons so that when my children practice, I'll be able to follow along--well, that and I've always loved music but never had the opportunity to put my fingers to the test. Or, I'd spend a good deal of time with a cup of java in hand, and a good book in the other--a nice change from detergent and suds, might I add. Or maybe, if I had more time, I might get around to FINALLY PAINTING and decorating our laundry room. After all, it would be enjoyable, so why shouldn't I jazz it up? I would clear out and organize my home office. Whew...if I had some extra time I would definitely do a lot more cooking for my family! Thanks for the awesome giveaway!! I'd play more with my little one. If I had more time I'd read more books! I'm almost sure I'd sleep in my extra time. If I had more time, I would work in my garden! We just moved and I am love having my little garden! I would do fun things with my spare time, like going biking or hiking. If I had more time I would work out more. I would use the extra time to focus more on my poetry and photography!